After both the Aurora shootings and the Tuscon shootings, some in the media (and elsewhere) immediately wondered whether the gunman was fueled by Tea Party- style rhetoric. It turns out that in both instances he (probably) wasn’t. But this apparent rush to judgment has caused many Tea Party-flavored folks to cry foul. “The media are picking on us”, they insist, ‘without due cause”. Is this claim justified? That bastion of impeccably fair and balanced journalism The New York Post went even farther, cherry-picking a few incidents to make it appear that shootings are generally carried out by left-wing nuts rather than right-wing nuts. (The Post also published the name and a large photo of the Tuscon shooter. Let’s hear it for The Post and responsible journalism!) And it quotes a single source, ABC, that speculated about Tea Party ties of the Aurora shooter, as proof that the media are unfair and unbalanced against right-wingers. “Media assumptions that violence is right-wing are routine — and routinely wrong”, the writer boldly declares. There appears to be at least a small amount of truth to the first part of the statement. The second part couldn’t be more mistaken. We’ve covered this topic before, but in case you slept through that lecture, here are the CliffsNotes. 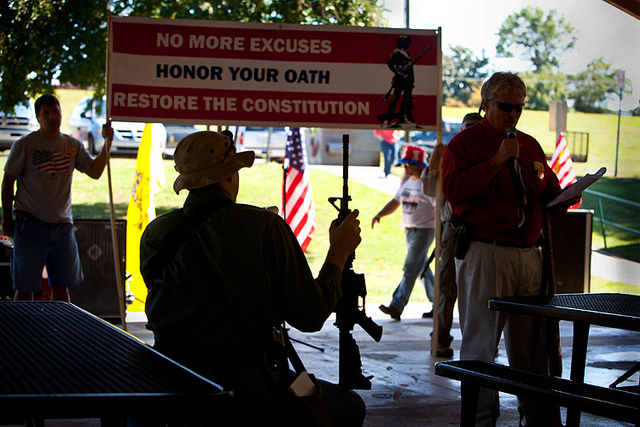 Right-wing extremists like Tea Partiers are very, very fond of their guns. They’re also very, very fond of vitriolic, eliminationist rhetoric that often includes blatant exhortations to violence. This has been accompanied by an unprecedented spike in violent threats against government officials (all of whom, coincidentally, have been Democrats). And it’s entirely possible that some unbalanced individuals who commit violent acts (including those in Tuscon and Aurora), whatever their political leanings if any, have been egged on by this constant bombardment of toxic talk and gun glorification. But let’s set aside speculation about what might happen, and look at statistics about what has happened. The Coalition to Stop Gun Violence has compiled an Insurrectionism Timeline covering violent actions, planned actions that were thwarted, threats and incitements of just the past four years. More than 150 of them, virtually all perpetrated by right-wing zealots. A more extensive chronicle was published a few months ago at Daily Kos, going back 30 years. It notes that since 1980 the body count from left-wing attacks numbers 7, while the body count from right-wing attacks is over 200. This includes the Oklahoma City bombing, which claimed 168 lives; you’d think that, even though it occurred 17 years ago, that alone would be sufficient to warrant misgivings about right-wing violence. But right-wingers, and those in the media (but I repeat myself) often prefer to focus on the actions of The Weathermen (who were not terrorists) 40 years ago. Note also that the Daily Kos tally includes only attacks motivated solely by ideology, excluding attacks on the basis of, for example, race or sexual orientation — which generally have strong (right-wing) ideological roots. So then, is it unfair if some journalists display more suspicion of right-wing violence than left-wing violence? Well, let’s see… a huge surge in threats, mostly echoing Tea Party rhetoric and all aimed at Democrats… Tea Partiers toting their guns to rallies and otherwise snuggling up to them… apocalyptic exhortations from right-wing fanatics… a score of more than 200 to 7… Dang, I can’t figure it out. You be the judge. You should note that when the Black Panthers showed up toting guns, that the California legislature decided to pass regulations against such activity! And No less than a Supreme Court decision, Presser v. Illinois, 116 U.S. 252 (1886), not only came to a different conclusion than the revisionist Heller-McDonald decisions about whether the Second Amendment applied to the States, but it concerned a “citizen militia group”, the Lehr und Wehr Verein (Instruct and Defend Association), a group of armed ethnic German workers, associated with the Socialist Labor Party. I guess they lacked the help of a Cato Institute to rig the decison, the way Cato rigged Heller-McDonald! But, Cato wanted nice, correct citizens for their actions. I have to agree that if it were lefties with guns, we would be seeing the US congress clamp down on gun ownership it would make the Aussie’s reaction to the Port Arthur shootings look like the usual reaction to such events in the US! Yet another point we are in agreement! Looks like we can add another shooting and 7 more deaths to the right-wing side of the scoreboard. It’s turning out to be quite a blowout. I’m just curious, but why do you list the Unabomber as a rightest? I attended the University of Michigan as well, and reading about him, it would seem that his views don’t fit neatly into either pattern. He was both pro-environment and anti-technology. He was a mixed bag, but if you have to lump him in one category or the other, I’d definitely call him right-wing.